Almost all my work involves me going places and photographing people in their homes or somewhere convenient for them. I have on occasion used my home as a make-shift studio, the walls are of a light enough colour and I can get just about enough distance that shooting portraits wide-open it is possible blur away the textured surface. I have included 2 portraits shot like this here, the first is of my friend Jane and it was taken because I had just been to NYC and purchased a new light modifier I wanted to try out, so I gave her a call and took some shots. 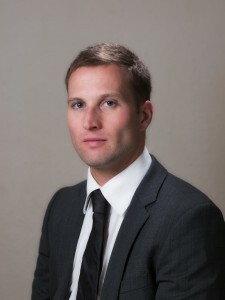 The second one is of Marc, this was a commissioned job, he needed pictures for CVs and general online networking sites. The lite panel I had used with Jane was also used in this shot but instead of with a flash shooting through it I had a bright silver cover on it and moved it in and out if the shots changing the fill on the right-hand side of his face. The lighting on him was pretty standard, the other variable was the background (in the other images of him), here I sometimes had it lit trying out pure white, gradients and in the one above, no direct lighting; if you are careful it is possible to get all the light from the other flashes to light it without shadows (there is no ambient light in these images). In the end I prefer this one, with the neutral warm grey. it is essentially a fairly conservative image but this background seems to me to give it a subtle twist, plus, he is not smiling which somehow makes it more like creative portrait rather than a corporate head shot.